Volvic is a natural spring water brand that is based out of France and is marketed to all customers worldwide. 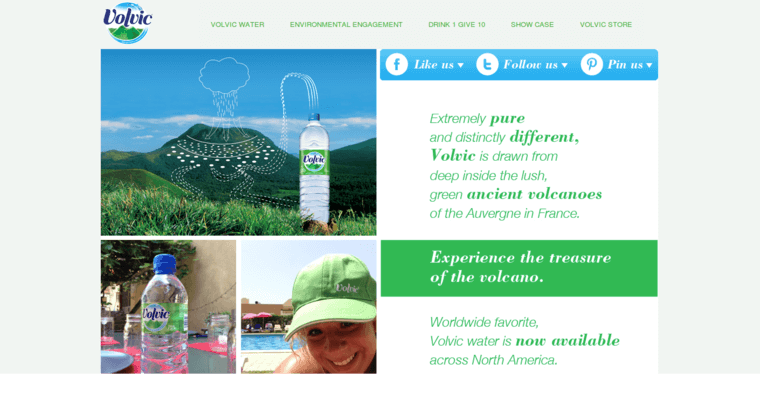 Volvic water starts off in a pristine ecosystem located in France, namely in a dormant volcanic park called Auvergne. It begins as rainwater that falls to the ground and then filters through it, taking years to do so in the long process of movement. After making its way through different mineral layers of rich volcanic rock, the water eventually collects into an underground aquifer, where it waits patiently until it is collected and then bottled at the source, which protects it from outside substances and pollutants. Because the volcanic rock layers protect the water, it comes out in an extremely pure state and retains its taste. It has a perfect mineral balance of naturally occurring electrolytes such as calcium, sulfates, magnesium, potassium and bicarbonates to maximize all its healthy qualities.